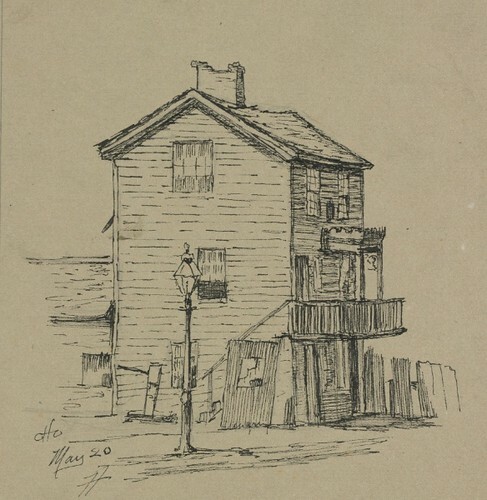 Otto Henry Bacher was born in 1856 in a house on River Street (now Old River Road) near St. Clair Avenue. He would go on to become one of the first artists to leave Cleveland and attain national prominence. Bacher began studying art in 1874. Most of the images that I will share here are from 1877 and 1878, just before he left Cleveland for Europe to further his studies. This group, from the collections of the Cleveland Museum of Art, provide some insight into the mind of a young artist. More than that, they show how one individual perceived the city around him. We have plenty of historic photographs, illustrating the things that people found important. These drawings and etchings are different. 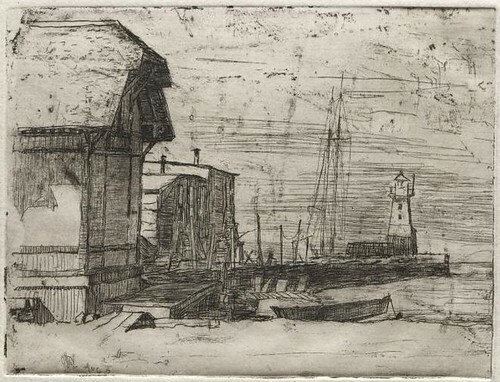 (An etching, to clarify, is a type of print where acid is used to cut the design into a metal printing plate.) In addition to focusing on scenes that would be of interest to the viewer, Bacher also depicted scenes purely for the aesthetic merit of their compositions. As a result, we have images of things that would have been thought too minor or too insignificant to photograph. Can these be taken as factual accounts of exactly how things were on this or that day in 1878? No, no more than a journal can be. But like a journal, they illustrate one individual's perception of the situation. The valuable analysis that Bacher provides can surely help us better understand what life was like in Cleveland in the 1870s. This map will help illustrate the locations that Bacher's drawings and etchings depict. 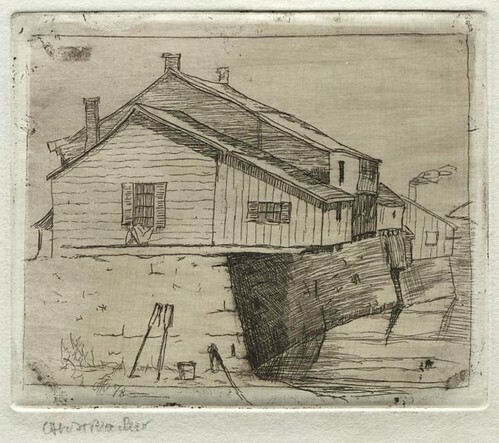 Many of Otto Bacher's Cleveland works focus on the area where he was born and grew up, close to the Cuyahoga River and Lake Erie. 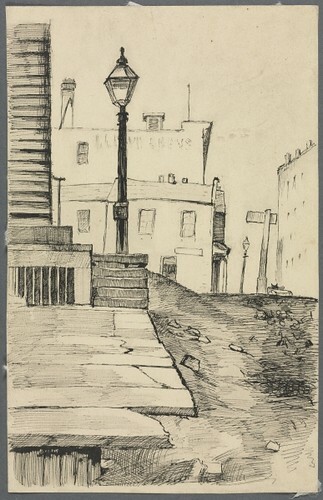 This drawing, Spring Street, Cleveland, (now West 10th between Front Street and St. Clair Avenue) was probably less than a block from where he grew up. 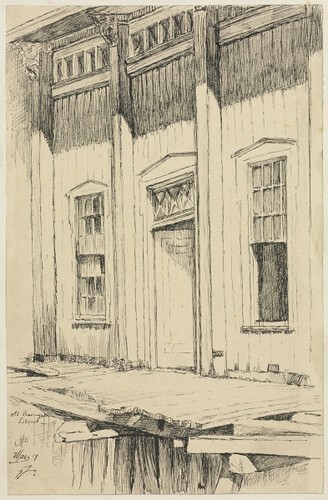 It appears that Bacher was looking north on Spring Street when he made this drawing. We can see small houses and sheds, which were probably residences, suggesting the level of poverty in the area. Clothes hang from lines on the slope to the right. There is a railing on the hillside, probably for a set of stairs going up it. Children play in the street and pedestrians walk down it, on the left. At night, the street was illuminated by the lamps, also on the left. 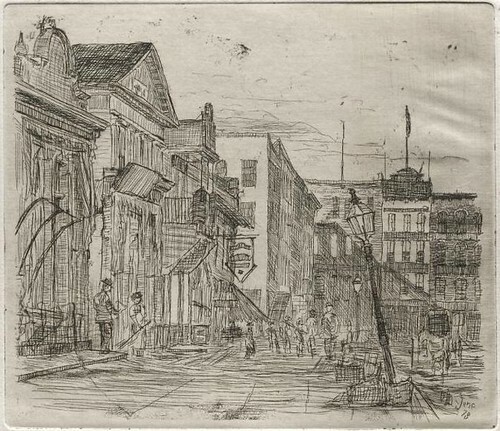 Bacher also made an etching of this composition, Spring Street, September 1878. 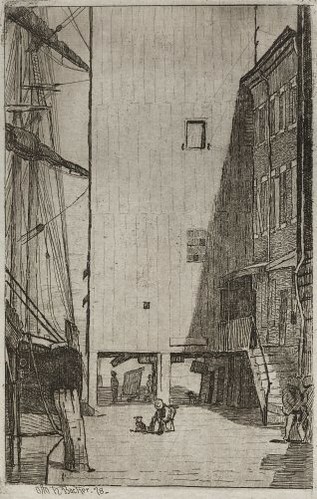 The print focuses more on the general composition, with fewer specific details. Ship and Elevator was probably a depiction of the Union Elevator (the only one that I've been able to locate on period maps) on Merwin Avenue near British Street. A ship is docked, probably while it waits to unload. In the midground, an man and a dog are seated. The buildings, probably commercial structures, were probably brick, judging by the stone lintels over the window frames. The second story entrances were either because the first floors were used for storage of goods or because of issues with flooding. The Old Passenger Depot was located due north of Spring Street, on the edge of Lake Erie. By this time, it had been replaced by the Union Passenger Depot, just to the east. This, the old depot, had clearly been allowed to deteriorate, as seen by the condition of the boardwalk in front of it. In Cottages, Cleveland, we catch a glimpse of several tiny houses, probably along the Cuyahoga. In an effort to expand these tiny spaces, additions were built, hanging over the river. The historical record is full of photographs and prints of the houses of the upper classes, lining the avenues and boulevards, and even contains a good sampling of those populated by the middle classes. We see very little, if any, documentation of residences like these. 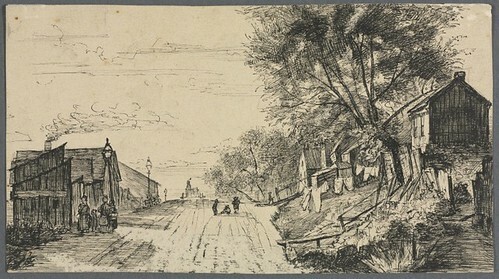 I'm guessing that Street Scene, Cleveland may have been drawn based on the northern corner of what is now Old River Road and West 10th Street. The layout of the streets is consistent, and it's the neighborhood that Otto Bacher grew up in. We can clearly see the deterioration in both the sidewalk and the street. 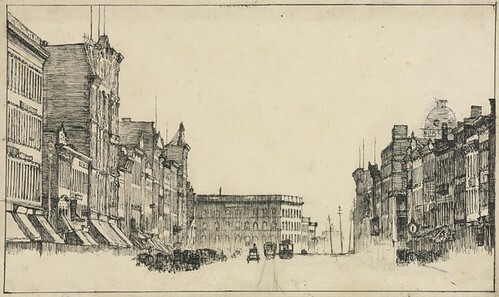 The drawing, Downtown, Cleveland appears, based on the shape of the layout of the streets, to depict Superior Avenue, looking west from Public Square. We can see a trolly or streetcar and the tracks that it travels. The bustle of commerce is obvious, though the exact activities are unclear. 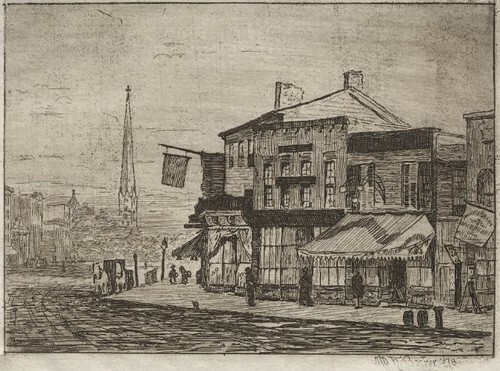 The Square, an etching, illustrates the southwest corner of Public Square. Pedestrians walk along the sidewalk, and a horse and carriage may be seen on the roadway. A streetlight has suffered some sort of damage and leans at an angle. If my interpretation of the angle is correct, the building with the light colored side shuold be city hall. 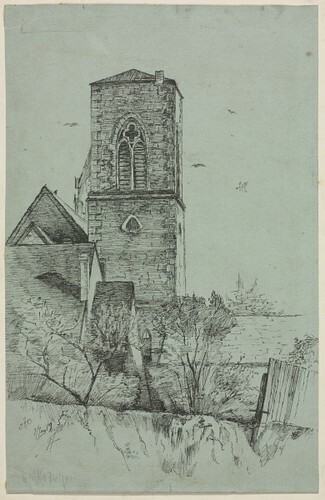 The etching Cleveland, Woodland Avenue and Eagle Street reveals, in the distance, one architectural element still present today - the tower of Old Stone Church. Though it may be dwarfed by skyscrapers today, it's important to realize the way the church towers must have been visible over much of the area. This view, looking approximately north northwest, shows an area that is now Jacobs Field. One business, with the awning opened, may be a pawn shop, based on the three balls hanging from the front of the building. Tower of the Chimes, Old Trinity, Cleveland depicts the tower of the Episcopal church, on the south side of Superior Avenue, just east of where the Arcade now stands - just west of East 6th Street. The most interesting part, to my eyes, is the unevenness of the land, which has now been completely flattened. We don't have enough information to identify the source for the composition, An Old House, Cleveland. One might guess, based on the slight slope revealed by the fence on the right, that it might have been somewhere on along the edge of the Cuyahoga valley, probably in the neighborood that Bacher was so familar with. As for the age, we have few clues. The number and size of panes in the double hung windows, 8 over 8 on the upper window on the side, and either 9 over 9 or 12 over 12 on the front, suggest an earlier structure - perhaps the first third of the 19th century. The pitch of the roof, the only other significant element that we have to work with, would be consistent with this, though it could also reasonably have been as late as 1840 or 1850 - but I doubt a house would have been considered "old" thirty years after its construction. The chimney shows deterioration, as does the fence. These are but some of the images that Otto Bacher created as a young man of his hometown - more do exist. His perspective reveals many details of this time that we simply don't see elsewhere. What do you see in his drawings and prints?